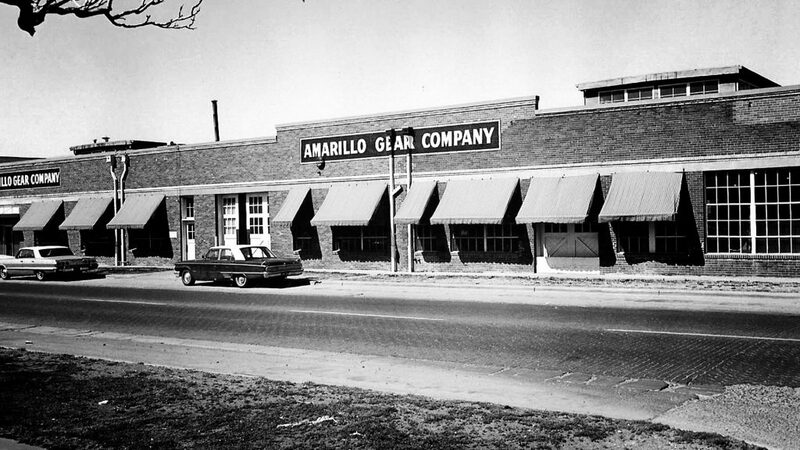 Amarillo Gear’s history began in 1917. From day one we’ve worked hard earning an industry reputation as the premier manufacturer of reliable right angle pump drives, right angle fan drives, and parallel shaft gearboxes. We’ve spent the past 100 years working closely with our customers to innovate and perfect our product and service offerings that owners and builders of wet cooling towers, irrigation pumps and fire water protection systems can rely on. In 1917 the Johnson family established the Amarillo Welding and Machine Works in Amarillo, Texas. One of our first product lines were vertical turbine pumps, primarily used by farmers to pump water to irrigate their fields. There was also a need for right angle drives to be used with the vertical turbine pump. The growing needs of a hungry nation required the ability to pump water from deep wells to irrigate thirsty crop fields in the Texas panhandle. So in 1934 Wesley Johnson completed design of reliable and affordable right angle gear box that could be powered by an engine, motor, or even a tractor to turn a vertical turbine pump. The design would be manufactured in Amarillo, Texas, and set the standard for reliability and low cost of ownership. 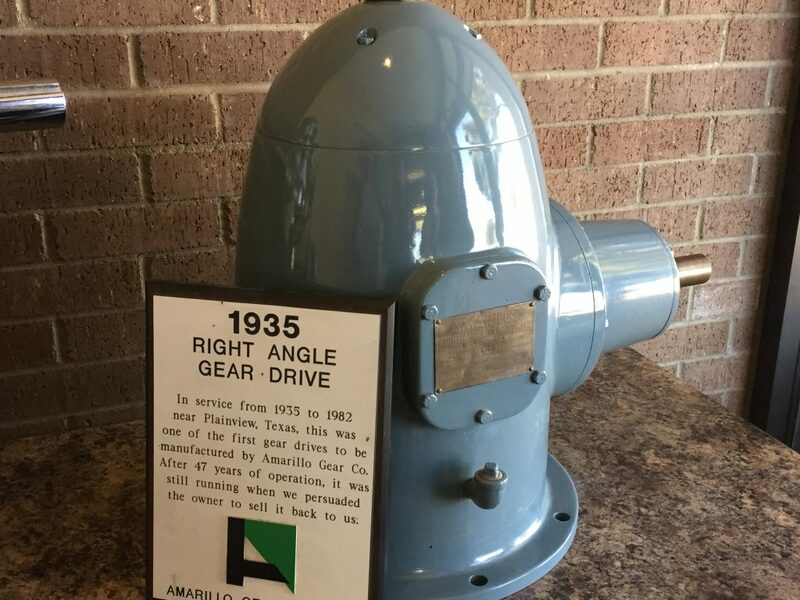 With the success of this vertical pump drive, Amarillo Gear shifted all focus to the manufacturing of these purpose built right angle gear drives. In 1972, in response to the growing needs from builders and owners of field erected wet cooling towers, packaged cooling towers and fin fan heat exchangers, Amarillo Gear began the design and manufacture it’s of extensive and reliable offering of right angle fan drives. This new line for right angle gearboxes was designed specifically for the harsh environment specifically encountered in this application. The conditions within a wet cooling tower pose a number of challenges for reliable operation and our right angle gearboxes had to be made to withstand these conditions including running 24/7, multiple on-offs per day, high starting torques and extreme operating temperatures. The design of this product line has proven out so well over 45 years of production, that key features have remained unchanged to the original design. These key features bring comfort to owners of Amarillo gear boxes because they know they can count on an Amarillo to be reliable and cost effective to own. Today we continue to be on the forefront of gearbox innovation and design. In 2013 we began design of an entirely new parallel shaft gear box for use specifically in air cooled condensers. This was driven by owners demands for reliability and lower maintenance costs not currently available from gearboxes offered from Europe and Asia. The result is our newest offering, the Quantum Parallel Shaft Fan Drive. The first model was introduced in 2016 and two new models will be available in 2017. Again, Amarillo is the leader in design and sets the standard others strive to mimic. Our goal has always been to meet the needs and desires of the owners of these types of gearboxes as well as the designers and builders of the vertical pumps, wet cooling towers, packaged cooling towers and air cooled condensers these gear boxes are used with. By always putting our customer first, Amarillo is thankful for its first 100 years of being the markets first choice for application designed gear boxes. We look forward to serving you for another 100 years.